Bomanite Thin-Set is a specially formulated polymer modified topping mix that will bond to any stable, structurally sound substrate. This unique system allows the installation of a thin, imprinted concrete topping when installed at 3/8″ thick and can be feathered to a zero edge. This easy-to-install system offers numerous design options for vertical and horizontal applications, inside or outside. Over 100 Bomanite or Bomacron patterns can be utilized with this product and Bomanite’s Patène Artectura coloration system can also be incorporated with this process. 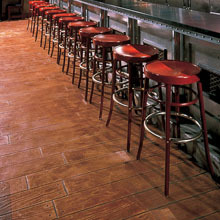 Available in 60 standard colors, Bomanite Thin-Set can also be created in a wide variety of custom colors.